Teeth whitening is the most popular cosmetic dentistry procedure, and rightfully so. It can make you look years younger, which in turn will increase your self-confidence and improve the way people perceive you. 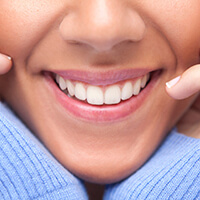 A study by the American Association of cosmetic Dentistry tells us that individuals with attractive smiles are considered smarter, friendlier, and more successful than others. Now you can claim a bright smile that will turn heads and open doors with at-home teeth whitening prescribed by your dentist. To help his patients achieve the stunning results they've dreamed of, Dr. Gunnin offers care with the Kör Whitening system, developed by Dr. Rod Kurthy. Kör is one of the most effective systems available, for multiple reasons. First, treatment with Kör is more comfortable, causing little to no sensitivity at all. As a result, patients who've had trouble with teeth whitening in the past may find that Kör works for them in a way other system haven't. Another reason to consider Kör is that it can cut through difficult stains. The most common and easily treated stains are caused by coffee, tea, red wine, and sodas. Stains that are more difficult to overcome are those caused by aging and tobacco. Even more notorious are stains caused by a medication like tetracycline. Using Kör, it's possible to erase stains of all kinds, even tetracycline stains. Kör also makes it possible to enjoy long-lasting results. That's because of Kör's in-office and at-home options. With the in-office solution, Dr. Gunnin and his Rogersville team can give your teeth the dramatic initial boost they need. Then, with a periodic touch-up at home, we can help you enjoy your outstanding results indefinitely. It will be like having a permanently whiter smile. For patients who would prefer just the at-home option, you could notice results after just one treatment. However, to experience the kind of truly dazzling results you would expect from the most effective whitening system available, it takes about two weeks. 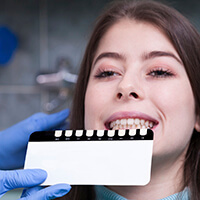 You'll simply wear your custom-made Kör whitening trays as you sleep, and the system's specially-formulated gel will go to work on your stains, erasing them and leaving you with the bright, beautiful smile you've always wanted.